The test set is used for determining the methylene blue value of 0/2 mm/ fraction in fine aggregates.ZI 3013A Methylene Blue Test Set, 210-240 V 50-60 HZZI 3013B 1 Filter Paper For Methylene Blue Test Ø:125 mm. High speed agitator motor, 400/600 r.p.m. 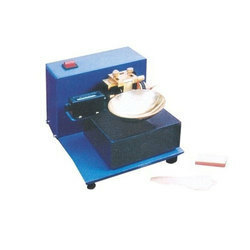 We are the leading manufacturer and Supplier of Soil Tester made from high quality material. The apparatus consists one each of compaction mould steel, complete with collar and base plate. Automatic Soil Compactor BS EN Rammer the automatic soil compactors is designed to provide a fully automatic uniform compaction of standard /modified and CBR specimens assuring conformity with the reference standard. Compactor is equipped with programmable digital counter which allows machine to stop at the preset numbers of blows. The height and weight of the rammer is adjustable to suit test requirements. An automatic blow pattern ensures effective compaction for each layer of soil and the rammer travels across the mould. The table rotates the mould in equal steps and the number of blows per layer can beset at the beginning of the test by the digital counter. User defined blow number and in-out distribution is also available. A standard proctor / CBR switch, emergency stop and start push buttons are located beside the blow counter. 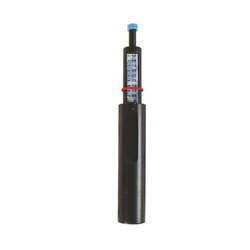 The water level indicators (electric contact meters) are portable, easy-to-use and reliable instruments for measuring water level and total depth in bore holes, wells, observation pipes, reservoirs, as well as control of pumping tests. As soon as the measuring probe electrode touches the water surface, the signal indicator on the instrument lights up with an audible alarm. The water level can be read on the measuring tape in meters (m) and centimeters (cm). Used to determine the moisture content at which clay soils pass from a plastic to a liquid state. Two Version are available. One the standard one the other is semi-automatic with timer where the cone is allowed to freefall for a period of 5 seconds including one each of 50 gm. 100 gm. 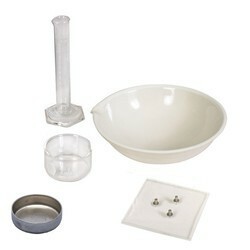 Weight, one penetration cone, preset counter measuring cup. 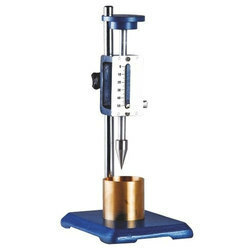 This is for mechanical analysis and also other laboratory applications for stirring Speed approximately. underload. 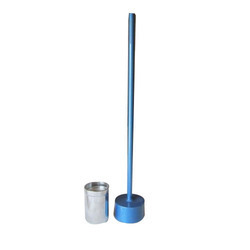 A dispersion cup is supported on a rest on the stand of the stirrer and has a removable baffle. For operation on A.C.supplied with dispersion cup or baffle cup. 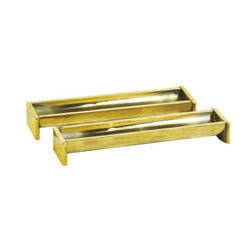 Accessories Metal tray, 300mm square and 40mm deep with hole. 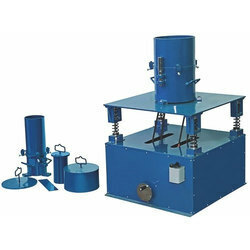 This apparatus is used for the in place determination of the dry density of compact, line and medium grained soils and for layers not exceeding 500mm thickness. 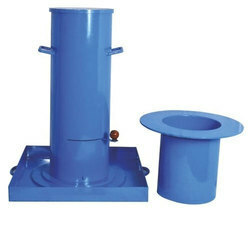 The complete apparatus consists one each of Small sand pouring cylinder,3 litre capacity fitted with conical funnel and shutter. Cylinder calibrating container, internal dia 100mm and 150mm height. Shrinkage limit is the maximum water content at which a reduction in water content does not cause an appreciable reduction in volume of the Soil Mass. 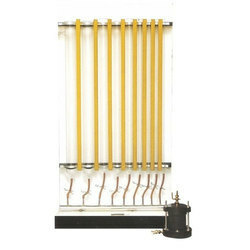 At shrinkage limit, on further reduction in water, air enters in to the voids of soils and thus keeps the volume constant.The apparatus can be used to determine shrinkage limit and to calculate other shrinkage ratio, shrinkage index and volumetric shrinkage. A simple mould which is filled with the soil under test.This is then dried and the resulting decrease is length of the specimen measured is expressed as the linear shrinkage. Same as ZI 3006 but fitted with a motor geared down to give approximately 120 rpm. ASTM grooving tool, height block,1cm high. 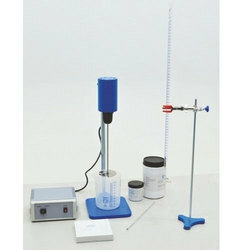 We are the manufacturer of Particle Size Sedimentation ZI 3010 (Hydrometer Method). 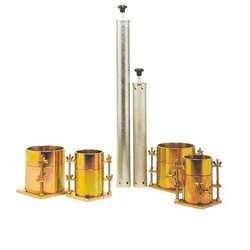 Sedimentation Cylinder, 1000 ml capacity (6pieces) with rubber bungs. 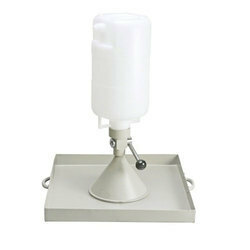 High Speed Stirrer, 4000 R.P.M, complete with baffle cup, for dispersing soil particles in water. 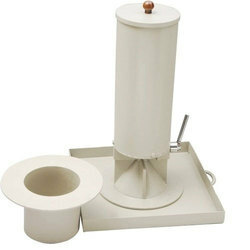 Used for grain size analysis of soils where more than 10% of the material will pass through 75 microns B.S. sieve. Manufactured from clear transparent glass having uniform clarity throughout the upper end on which density scale is engraved. The scale range is 0.995 to 1.030 density(gms./cc) at 270C smallest division on the scale is 0.0005. Conventionally particle size distribution analysis is carried out using pipette and hydrometer methods. Whereas in hydrometer method it is possible to determine particle sizes in the range 75 microns, the method involves computation and it is time consuming. The pipette method can be used for determining only the percentage of specific sizes less than 0.02, 0.006 and 0.002mm as a percentage of total soil sample.The plummet balance method to determine sub sieve particle size for the entire range is very rapid and only manipulation of height of the balance, so that plummet sinks to the right depth is required.The percentage of soil in suspension is directly indicated by a pointer over a graduated scale.A vertical rod is mounted on a sturdy base having leveling screws.A pointer with steel pivots turns is jewel bearing an moves over a graduated scale.Scale graduations are marked 0-100% x 2%. To the other end of the pointer a plummet is hanged. Rack and pinion arrangement is provided on the vertical rod for adjusting the height. Supplied with a chart showing relationship between “K” and temperature of suspension of soils of varying specific gravity from 2.4 to 2.8 to help in solving stroke's equation. Supplied complete with one Perspex plummet one measuring jar and one rider weight for zero adjustment and rider weight for adjusting the pointer to 100%. Face of the rammer 2"
The apparatus consists one each of compaction mould steel, complete with collar and base plate Compactor Rammer. Instrument consists one each of compaction mould steel 150 mm I.D. x 127.3mm height volume 2250cc. Complete with collar and base plate. 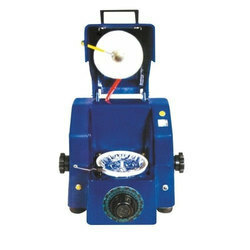 Compaction Rammer is 4.89kgs. in weight x 450 mm controlled fall. Instead of steel moulds, gunmetal mould are also available. We are the manufacturer of Pocket Penetrometer. 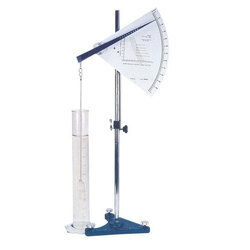 This instrument is used to estimate approximate unconfined compressive strength and the estimation to shear strength of soil Cohesive soils can also be classified in terms of consistency using this Penetrometer. This is a handy and convenient instrument. 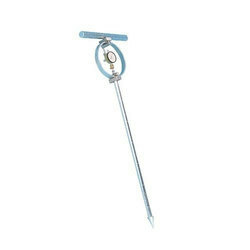 It consists of a light weight barrel assembly with a polished and ground steel loading piston plunger. A direct reading scale is engraved on the piston barrel and indicates load in kg. / sq.cm. 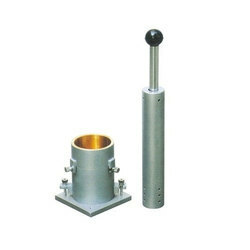 A maximum load indicator ring is provided on the penetration plunger. The calibrated spring is heat treated and plated for rust resistance. Supplied with carrying case. We are the manufacturer of Speedy Moisture Meter (D2 Large). The unit consists of a pressure vessel with clamp for sealing cap, capacity is 20 gms. 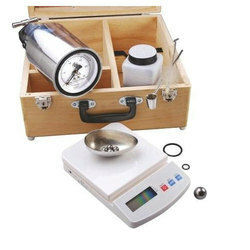 Rubber sealing gasket, pressure gauge calibrated in percentage moisture content 0-25% x 0.25% on the wet weight basis, an electronic balance for weighing sample, a scoop for measuring carbide reagent, a bottle of reagent, one cleaning brush and a set of 4 steel balls for thorough mixing. Complete in highly polished wooden carrying case with handle. The unit consists of a pressure vessel with clamp for sealing cap, capacity. 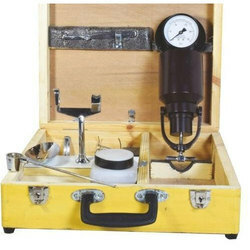 Rubber sealing gasket,pressure gauge calibrated in percentage moisture content on the wet weight basis, a counter poised balance for weighing sample, a scoop for measuring carbide reagent, a bottle of reagent, one cleaning brush and a set of 4 steel balls for thorough mixing . 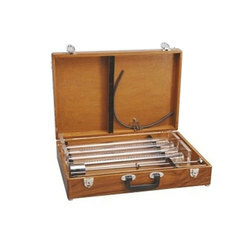 Complete in highly polished wooden carrying case with handle. 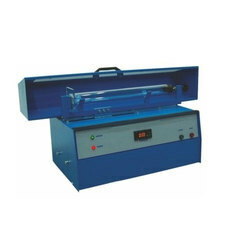 It is a fast ,accurate method to derive direct moisture % in a sample by Loss on Heating Method. Heating arrangement consists of a 250 watt heating lamp with a solid state power stat to control rate of drying and also temperature. 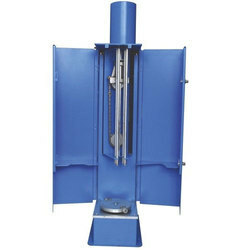 We are the manufacturer of Permeability Apparatus (Falling Head Permeability). 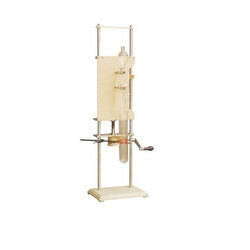 The apparatus is used for the laboratory determination of permeability of soil using a constant or a variable head. This test is recommended for soils with coefficient permeability. The maximum particle size of the soil which can be tested in the mould is 10mm. This is used for determination of in situ dry density of natural or compacted fine grained soil, free from aggregates. A cylindrical cutter is used to extract a sample of the soil with the help of a dolly and rammer. From the weight, density and the moisture, and dry density of the soil is ready calculated .It consists one each of: cylindrical core cutter mode of steel, 127.3mm. Long and100mm internal diameter. Steel dolly, 25mm high with a lip to enable it to be located on top of the core cutter, rammer with detachable steel rod. This method applies for soil containing up to 10% of particles retained on sieve. The equipment is used to rotate two gas jars. 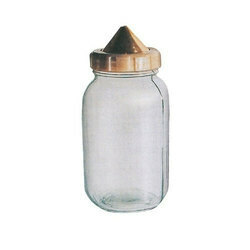 Glass Jar is 1 litre in capacity with rubber bung. Casagrande method in mechanical form is known as liquid limit method and has been in use for soil mechanics for a number of decades. The liquid limit data of soils is useful to correlate mechanical properties of soil, such as compressibility and lower shear strength. Liquid limit is the water content at which soil passes from zero strength to an infinite strength, hence the true value of liquid limit cannot be determined.For determination purpose liquid limit is that water content at which a part of soil, cut by a groove of standard dimensions, will flow together for a distance of 1.25cm under an impact of 25 blows in a standard liquid limit apparatus. The soil at the water content has some strength which is about 0.17N/cm. sq. (17gms/sq.cm.) . At this water content soil just passes from liquid state to plastic state. It consists on a brass cup held on an adjustable bracket. The cup can be adjusted for a fall of 1 cm and can be raised an dropped on a rubber base of standard hardness by cam action. 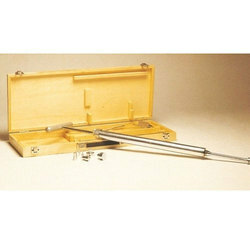 Complete with one Casagrande grooving tool, one ASTM grooving tool and a height gauge block. A counter to register the number of blows. We are the manufacturer of Grain Size Analysis (Pipette Method). This is for the determination of the sub sieve particle distribution in a soil sample by mechanical analysis. An analysis of this kind expresses quantity the proportions by weight of the various sizes of particles present in the soil. 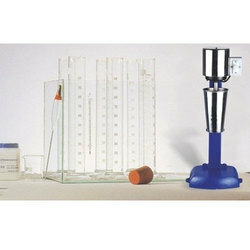 It is recommended as a standard procedure to use dispersion agent to avoid flocculation.The apparatus consists of a sliding panel which moves up and down by means of a screw allowing Anderson pipette fixed to it to be raised or lowered vertically. A sedimentation tube is held by a laboratory clamp provided on the stand below the pipette. The depth of immersion is measured by a scale graduated in mm at the side of the sliding panel. Supplied complete with Anderson pipette 10ml. 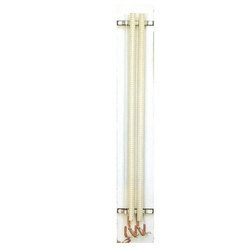 At the side capacity made from glass, and a sedimentation tube also of glass of 500ml capacity and 50nos. Test form pads. The instrument consists of a needle attached to a spring loaded plunger, the stem of which is calibrated to read 0 to 40 kg division. 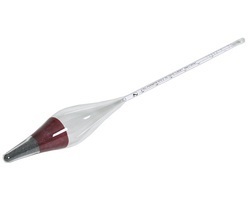 Long stem is graduated at every 12.5mm to read depth of penetration and for use with needles of larger areas. The small penetration stem is also graduation in 12.5mm division and is used with needles of smaller areas. And one Tommy pin is supplied. 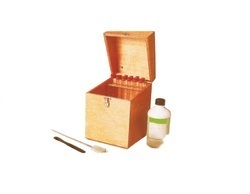 Complete as above in a wooden carrying case. This is fork determining the bearing capacity of sub grades orfor compaction control. It also used for rapidly of soils in shallow exploration work. Consists of a study handle under. Which is fixed a sensitive proving ring. An extension piece is fixed to the bottom of the proving ring and carries a detachable penetration cone at it stip. An optical viewer is provided to facilitate reading the dial gauge by the operator. Simplified for single person operation. A calibration chart is provided for the proving ring. Instrument is complete in a wooden carrying case. We are the manufacturer of Universal Permeability Equipment. 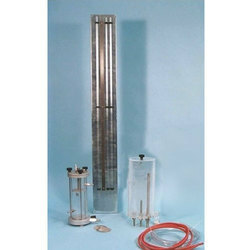 Same as ZI 3030 but instead of a set of three glass standpipes a stand with nine glass tubes of 6mm, 10mm,20mm, 25mm, 40mm, 50mm, 60mm, 70mm, 75mm, bore tube is provided with over flow arrangement for constant head tests. The remaining tubes are used for falling head test. 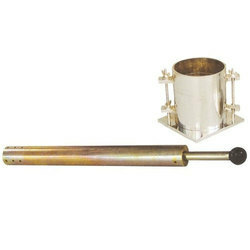 We are the leading manufacturer and supplier of Sand Pouring Cylinder. 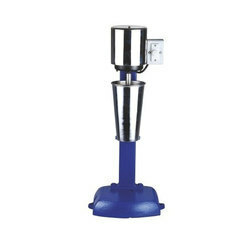 We are the manufacturer of Sand Density Cone Apparatus. Used to determine the in-situ density of fine grained compacted soil. The test consist in digging a hole into the ground and then collect, dry and weight the sampled soil.The hole is then filled with dry sand from the cone container. 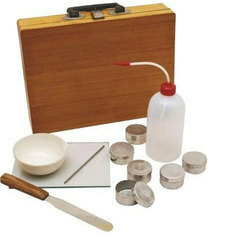 The apparatus consist of a double metal cone,one plastic 5 lts jar a metal tray with centre hole. We are the leading supplier of Pycnometers useful to determine specific gravity of clays, sand and gravel of size smaller than 10mm. The equipment is used for the determination of the relative density of cohesion less free draining soils and meets the essential requirements. 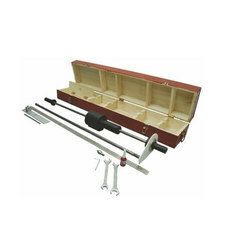 The equipment consists one each of: Vibratory table, with a cushioned steel vibrating decks about 75cm x 75cm. 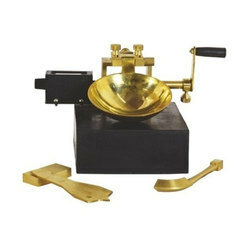 It has a frequency of approximately 3600 vibratory table, minute under a11.5kg load. Amplitude is variable in between 0.65mm in step of 0.05 to 0.25mm, 0.25 to 0.45 mm and 0.45 to 0.65mm. 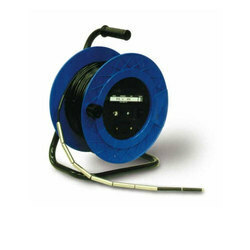 Suitable for operations on 415V, Three Phase supply. Cylindrical metal unit weight mould, 3000ml capacity. Guide sleeve with clamp assembly. Surcharges base plate for mould.Handle for surcharge base plate. Surcharge weight. 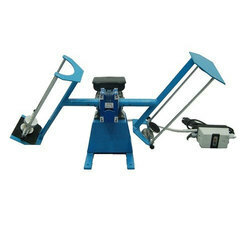 The total weight together with surcharge base plate and handle is equipment to 140 kg. / cm2. For mould.Cylindrical metal unit weight mould 15000 ml.capacity. 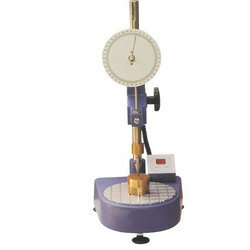 (Total weight together with the above mould surcharge weight is equivalent to 140 kg./ cm2) dial gauge 0.01mm x 50mm travel. Extension piece 25mm for dial gauge. A very useful kit to determine on the spot soil pH value. Thisis a compact kit easy to carry on site.